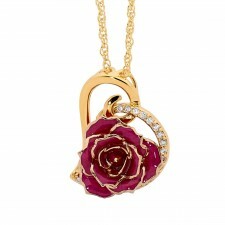 An exquisite pendant featuring a central miniature rose bud made from natural rose petals, which have been glazed and 24k gold-trimmed on the edges. There are two styles of pendant. One is shaped like a heart, and the other has two leaf figurines. Both have an inlay of sparkling synthetic diamonds. Impeccable detail and a lifetime warranty, which includes a certificate of authenticity. 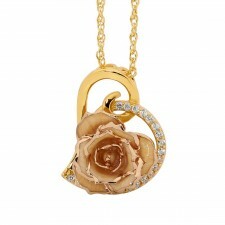 It is created using real white miniature rose petals perfectly glazed and trimmed with 24 karat gold. 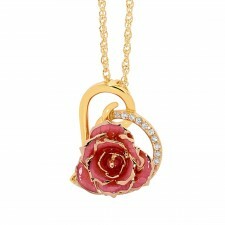 It is created using real pink miniature rose petals perfectly glazed and trimmed with 24 karat gold. 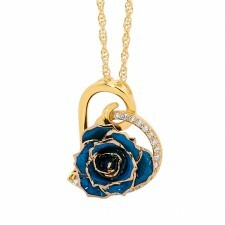 It is created using real blue miniature rose petals perfectly glazed and trimmed with 24 karat gold.